Handicapped from the outset, those French lessons I always threatened to take up still just a distant aspiration, my understanding of the half-narrated half poetically lamented lyrics of the Haitian arts and literature polymath, Frankétienne, prove almost impossible to understand. The fact that it isn’t even strictly French but a close relative, the pidgin cross-pollinated creole, makes it no less unfathomable. All of which should make a review difficult. However, what maybe lost in translation isn’t lost in the delivery, which can be captivating and entrancing or resigned and plaintive. A grand doyen of Haiti, Frankétienne has busily created a vast cannon of work over the last fifty years, his vocally shrewd protestations and spoken word travails filling countless volumes of poetry and novels. Equally talented with a brush in his hand, acting on both the stage and on film, and even teaching, Frankétienne is an innovative chap with linguistics too: during the heinous Duvalier dynastic rule of Haiti in the late 50s to mid 80s he would adopt a mixed language of both French and creole to evade detection and get away with denouncing their authoritarian reign. It is however his 1999 ‘tortured hymn to Port-au-Prince’, Rapjazz, Journel d’un Paria that is once again given a new lease of life, with the narrated and originally composed musical project Chaophonies. Complimented by the tentative, and for the most part gently emotive atmospheric backing of guitarist and singer/songwriter Mark Mulholland, a peregrination journey through the rambunctious, scary and sometimes archaic capitol of Haiti is made melodically spiritual and at times even funky. A long way from home, the Glaswegian Mulholland who at various times has bunked up with a host of colorful and hardliner bands in Prague, Berlin and Paris, journeyed west to Haiti in 2010 where he soon hooked up with Frankétienne; striking up a mutually beneficial partnership that has so far included two spoken word/music performances, one of which the ‘Délires d’un Prédateur déchu’was filmedand released as a documentary by the film-maker and fellow Haitian native, Arnold Antonin – who is also currently documenting the life and times of the poet, including extracts from this latest project, for a future DVD release –and a fleeting but lasting guest spot on a Mulholland and Graig Ward collaboration, the Waiting For The Storm LP. As with his guest appearance on the often remarked as a ‘bold’ move ‘Les Belles Promesses’ from that LP, Frankétienne’s distinctive polygenesis verses proved animating and full of sagacious vitriol. 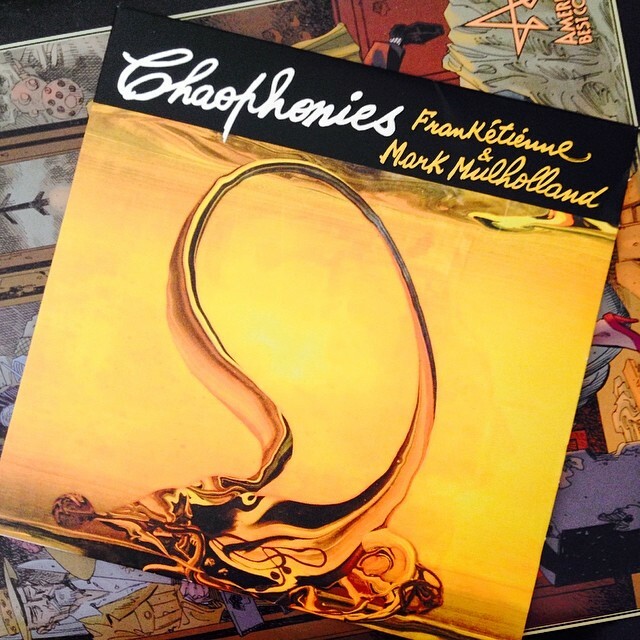 Poised and mostly refined to only the most important musical accompaniment, the Chaophonies album is quite stark in places with a meandrous esoteric and southern states of America toned country guitar, sometimes the main if not only partner on this moody recital. Suffused with a reoccurring whiff of the former French colonies, both the Haitian and the Louisiana bayou, the very first track, ‘Mots Et Rêves’ (‘Words and Dreams’), beckons the listener into Frankétienne’s chaotic city home with a surprisingly quaint waltzing accordion, whilst a swamp like Voodoo mysticism and drawling twang permeates throughout: a plucked geographically evocative banjo here, a waning southern fired fiddle and guitar there. Prowling into a broody chaotic heart of darkness on ‘Ville Schizohonique’ or launching into a lo-fi Afro-funk with the excitable ‘Potoprens Chouk’, or even dreaming wistfully on the Baroque ‘Rêves’, there are plenty of finely attuned moods to peruse. Rasping, growling, panting, throaty, and even impersonating the lumbering slow progress of a steam locomotive, the vocal dictation conveys the full spectrum of elation, despair and weariness. And the fact that it’s delivered in a foreign tongue doesn’t make it any less engaging or connected for those who do not speak the lingo. Hardly a blinkered paean to the country of his birth and the home-from-home for Mulholland, this performance articulates and verbally gesticulates the history and present cacophony of riches and far from solved social, economic and natural disasters that besiege the island like a plague.